Lightroom isn’t an easy install with munki. There are some tricks you have to keep in mind. 1. Detect if Lightroom is already installed. For this munki has the installs section. You can create the necessary entry on a Mac that has Lightroom already installed issuing the makepkginfo command. This is written as part of the post_installscript section. You have to set the country_region settings according to your country. Probably it isn’t necessary to write the settings in the Non_localized user template too. This too is written as part of the post_installscript section. This script goes into the uninstall_script section of the munki plist file. Voicemail nicht verfügbar Zugriff konnte nicht autorisiert werden. Recently I changed my Swisscom Natel infinity contract from residential to business. The price is the same but the business contract contains the Combox Pro feature free of charge which gives you much more functionality. The business contract is only available if your phone is owned by a company but you can have Combox Pro as a payed for add-on for 5 CHF a month if you have a privately owned phone. After the switch to the business contract my visual voicemail stopped working. 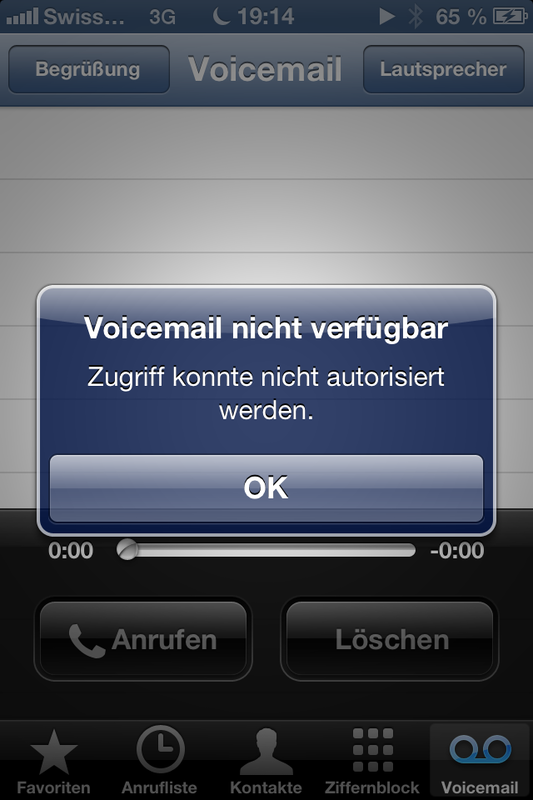 The message shown by my iPhone was “Voicemail nicht verfügbar Zugriff konnte nicht autorisiert werden.” (Just added the German text in order to make this blogpost through search-engines available to others that get the same error message.) I called the hotline and they told me that Combox Pro isn’t compatible with Visual Voicemail. I almost did believe that but did some further investigation. In deed I found a discussion dating from 03/2013 that it isn’t possible to have Combox Pro an Visual Voicemail at the same time. In an other thread (in german) someone mentioned that it wasn’t possible with prepayed contracts either but now is. And indeed it is now possible to have Visual Voicemail and Combox Pro. At the end of february 2013 BitCasa ended it’s beta phase. Until the end of the month there was a 50% discount on the one year membership. So I decided to give it a try and go for it. Over the first days BitCasa was really annoying. Files and folders I tried to copy to the unlimited drive din’t copy at all – even after days. The forums were full of complaints from Windows and Mac users. Meanwhile, after a month it got better. I am able do upload files in a reasonable time. What annoys me still is that the BitCasa App on the Mac requires administrator rights. That is your user account that you use for uploading files has to have Administrator rights in the machine. This is a real no go! Bitcasa uses a temporary directory for caching files while uploading them. This directory has more than 40 GB in size on my machine. If you have limited space on your disk because your have a SSD drive for example on a MacBook Air you should definitively have a look at the BitCasa settings and reduce the cache to a reasonable size. Second you should exclude the cache from your Time Machine backups. For local folders on your harddisk BitCasa does support mirroring them to BitCasa but it doesn’t support mirroring of mapped network drives. Thus you can’t use BitCasa as a backup media for your NAS for example. Because I had some kind of backup in mind when I payed for BitCasa – well that doesn’t work for me now. On the iPad access to my files required me to log out and in again. After that the folders were accessible but I can’t see any pictures in them. Definitively a serious bug. What I’m missing most in the iOS app is a tree view of my files for navigating and browsing through them. Under the Photos section pictures are accessible by the name of the folder they are stored into. But as I have a structure that always ends in the name of the family member that took the photo all albums have the same names. This is the same with the web interface. There are some more issues with BitCasa that do annoy me, but I don’t want to elaborate further on this because they just make things worse. To come to a conclusion I’d say for the 50% price reduction BitCasa is OK for me but it wouldn’t for the full price. If you plan to use the unlimited drive and pay for it I recommend testing every single feature that you intend to use out befor paying for the service. Read the BitCasa support forums and see which problems other users have. Microsoft SBS 2010 is a strong alternative to OS X Server. Pricewise it’s more expensive than OS X Server but it’s a reliable server platform an a viable alternative ot OSX Server especially if you have to host Windows clients too. Today I had to experience a rough glitch that was easy to fix, but the fix wasn’t obvious. After rebooting a SBS 2011 Server it booted into directory service repair mode. Ups – what’s that? Server 2008 R2 somehow goes into Active Directory maintenance mode resulting in the Servers inability to log in via Active Directory accounts. No AD user was able to log in – OMG. A Reboot didn’t fix the problem. The server kept booting into safe mode. My first reaction was to restore form backup, but the restore failed because of too little disk space on the ESXi 5.1 datastore. So I called a Windows trainer who luckily could help out within minutes! 1) Log in with a local administrator account. This account is created at installation of the SBS. Hopefully you remember the password. Puh! After a reboot everything was fine again. I’d almost spend my whole easter reinstalling the server. Sometimes you’d just need to know the right guy! After we deployed our standard DeployStudio image to a brand new iMac with a 3TB FusionDrive for the first time we had to realized that in Disk Utility the volume showed up as corrupt after a check. Somehow DeployStudio (1.5.17) isn’t ready for now to handle FusionDrives. The question was: “How do we fix the now corrupted drive?” After reading an article in the German Mac&i magazine (issue 9, page 150) and some googling we came to the solution described below. Especially one article on http://blog.fosketts.net was a valuable read. 1) Boot off a external drive e.g. a recovery disk on an USB-stick. 2) Unmount the disk that has the FusionDrive on it. 5) This step is not really necessary but it might be a good idea to delete the partition schema. After a reboot you can check the Volume in Disk Utility. The volume test shouldn’t display any errors.